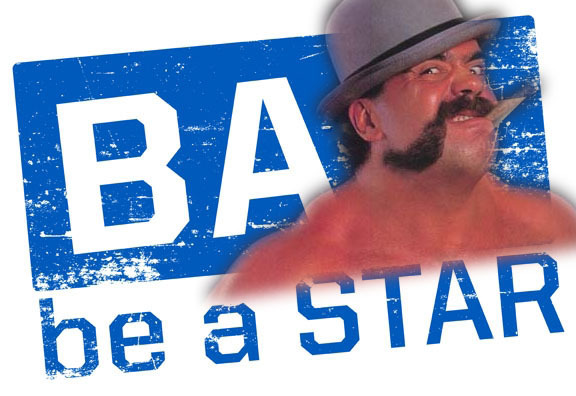 Headlies: WWE Defends “Be A Star” Program After Bully Busick Matches Surface On Youtube - WrestleCrap - The Very Worst of Pro Wrestling! 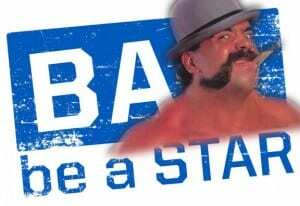 Weirton, WV – WWE’s anti-bullying campaign program “Be A Star” has come under fire recently after videos on Youtube have surfaced showing that they once employed a wrestler by the name of “Big Bully Busick”. Decked out in a derby hat, cigar, and bushy handlebar mustache, Busick entered the World Wrestling Federation under the tutelage of manager Harvey Wippleman. Several videos have been uploaded to the video-sharing website over the past few months showing Busick antagonizing fans, harassing female announcer Mike McGuirk, and engaging in other activities deemed bully-like. His matches against Davey Boy Smith, Sid Justice, and Bret “Hitman” Hart show similar, inappropriate behavior. Busick, who has since retired from the ring, said, “I never wanted to be a bully. It started in Georgia Championship Wrestling, but the only good part about the character was the mustache. Vince really pushed it on me. He said he was going to stomp my grapefruits if I didn’t do it. He’s not going to hear about this is he?” asked the former bully, adjusting his protective cup. 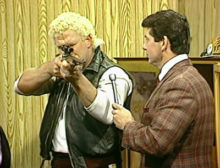 10 Responses to "Headlies: WWE Defends “Be A Star” Program After Bully Busick Matches Surface On Youtube"
And the best way to settle a personal matter with someone else is to hang something from a ceiling and then fight each with a ladder to settle the issue. Thankfully it settled the whole Rey Mysterio-Eddie Guerrero drama over Dominic in the past. I know I had to settle an inheritance issue with my family by having a Money in the Bank match in our living room. At least have the decency to post the truth if you are going to quote me. I never made any such comment. WrestleCrap is a humor site, Nick. This is just a satire piece. Nobody thinks you actually said that up there. We didn’t mean to upset you and I’m sorry if we did. We sometimes make up outlandish things in our attempt to be funny. For the record, the above Headlie is completely fictitious and was made up by Jordan. It doesn’t represent anything that the real Nick Busick has said or done. I hope that clears things up. The “Nick” here is a big fat fake. He wouldn’t know a computer from a barn animal let alone satire from truth. 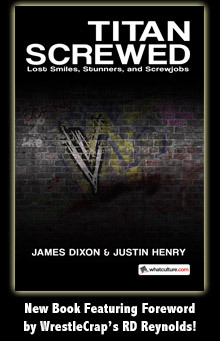 At least have the decency to have the brains to actually READ THE F@@KING THING AND KNOW IT IS PARODY rather than just sprout gibberish just because you’re not even good enough for TNA to hire you for a handful of soup cans per month. Honestly I don’t think its humor but more of a prediction. LOL, this can’t be for real…does Big Bully Busick frequent wrestlecrap, or is this dude a troll? INDUCTION: Dr. D’s GUN SHOW – BANG!